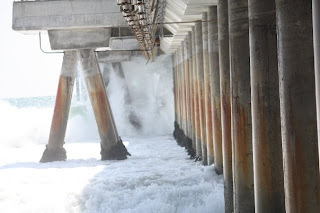 (Photo above by Nathalie Brouwer, Friday, July 24, 2009, shows the Venice Pier under siege by the Summer Storm Surf that barreled it's way across the Pacific Ocean and over 4,000 nautical miles driven by wind). 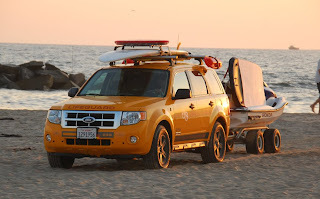 *** And get a load of these stunning photos below shot from the Newport Beach Lifeguard Rescue Boat on Friday, July 24th by Capt. Brent Jacobsen. Copyright Brent Jacobsen 2009. All Rights Reserved. Used here with permission. Do not reproduce without permission. Thanks Brent for sharing your photos ! And special Gaucho Kudos and Thanks to Gaucho Greats/Alumni Greg Boyer and John "Spanky" Dobrott for giving "County Recurrent" the heads up on these Great Photos ! Go Gauchos ! 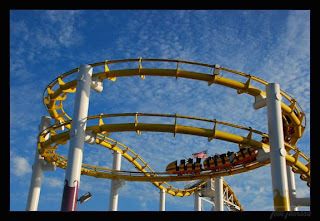 (The Two Photos above by and Copyright Tom Thorson 2009. All Rights Reserved. Used here with permission. Do not reproduce without permission). 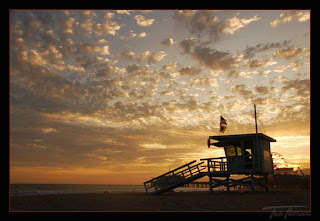 This blog post began on July 22, 2009 as "Summer Storm Warning!". 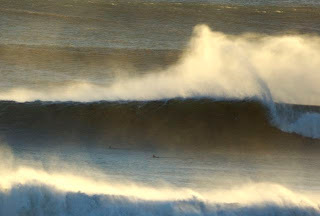 Now that the Swell has come and is tapering off, let's set the record straight with some photo and video evidence. 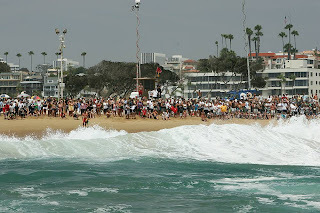 To wet your palate, however, we will start with this photo below shot by Marty Kooistra on Sept. 23, 2007 at the Wedge. Used here with permission. Photo and Copyright Mary Kooistra 2007. All Rights Reserved. Do not reproduce without permission. 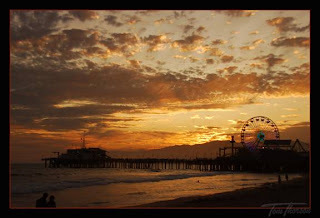 And if you are wondering what it looked like at Venice Pier this past Friday, check out the following photos by LACo's very own, Nathalie Brouwer. Used here with permission. Copyright Nathalie Brouwer 2009. All Rights Reserved. Do not reproduce without permission. 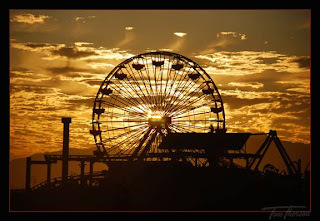 Many Thanks to Nathalie for sharing the following stunning photos with us. 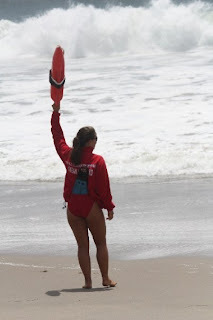 The female lifeguard featured in the photos below and taken by Nathalie is none other than LACo Rookie Recurrent, Kailey Makuta, and daughter of Jimmy Makuta. 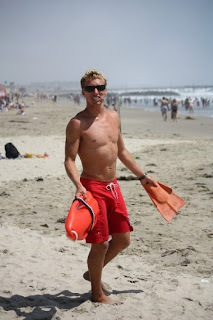 And the young stud male lifeguard is none other than "Son of Contarsy", aka Tyler. 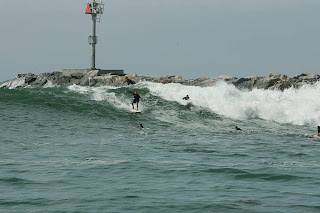 Below, just another day at Buccaneer, just south of the Venice Pier. 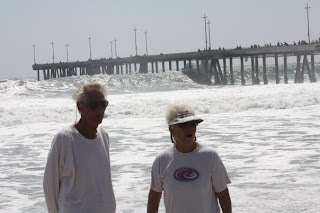 Nothing like a pier rescue in some waist high surf to make your day go by quicker..... woo hoo ! Photo by Nathalie Brouwer. Wow ! 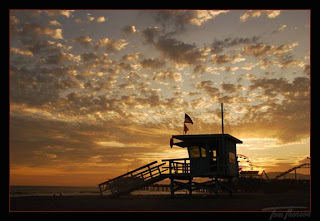 "Friday July 24, 2009 ~~1900 hrs., south of the Venice Pier, Professional/Recurrent LACo Ocean Lifeguard, "rookie", KAILEY MAKUTA, was standing very proud on the Buccaneer tower deck and very ready to go with her can and fins. WE, the parents, Mr. & Mrs. MAKUTA , family, friends, youth in junior lifeguard championship t-shirts..... 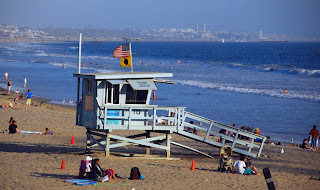 I could certainly recognize this "lifeguard family" which included another two thousand spectators on the pier and the beach, ALL WATCHED !!!!!!!..... 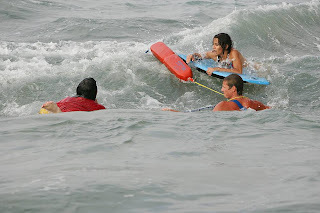 as a single swimmer was swept out to sea, the rip current between Buccaneer and Driftwood was about 20% volume in the beginning as Kailey left the tower. The swimmer had a wet suit on and fins and was still struggling at the head of the mushrooming rip and predictably soon became a soon to be rescued victim. 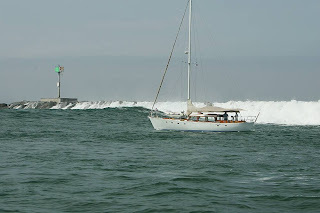 I have never seen anyone swim so fast, with such control, and purpose, in my life; now the rip is at 100%, past the end of the pier, estimate 15 knots of outbound current plus her hull speed....whoooooohoooo !!! 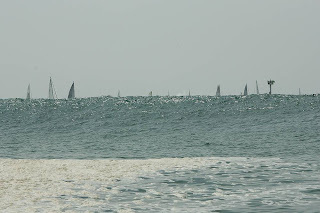 The incoming wave faces were 10~15 feet and very thick, maybe 30 feet. In a few seconds, Kailey swam the victim out and was received by the Baywatch crew. All of the rescue was picture perfect: the stand-by back-up guards, and "Team Morales" were all very much on Top Of It ! 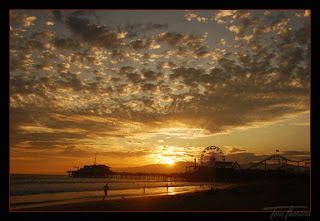 And to Lydia, mukutos to you and the pier crew !!!!!! p.s. 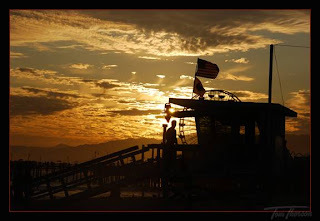 Mickey later closed the Venice Pier to fisherman and spectators at sunset; fyi, no duct tape was involved. Thanks Randy ! 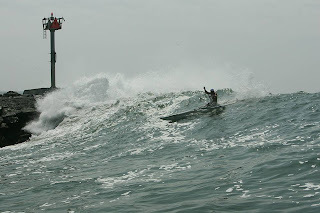 Epic first person account of an Epic Rescue in Epic Surf ! 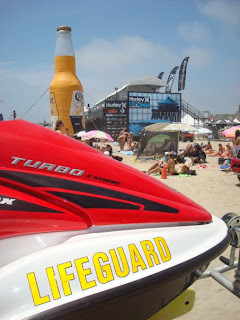 On hand on the last day, Sunday, was Kai Weisser, a Huntington Beach City Lifeguard who took the following two photographs. Copyright Kai Weisser 2009. All Rights Reserved. Used here with permission. Do not reproduce without permission. Thanks Kai ! 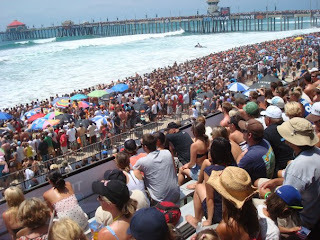 Yes, to answer your question: Surfing Is A Spectator Sport ! 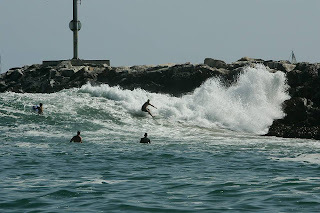 *** And how about some actual video footage shot at the Wedge this past friday, July 24th in the afternoon ! 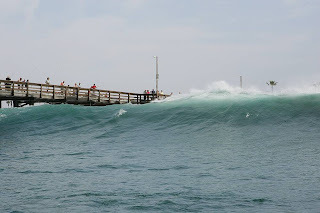 Earlier that same day a 50 yr. old man from Lawndale, Calif. died while bodysurfing at the Wedge which required two Newport Beach Lifeguards to extract him from the rock jetty where he was found with only a faint pulse and resuscitation efforts on the Rescue boat proved to no avail. 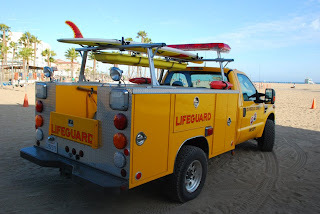 One of the lifeguards even was fortunate to escape with his own life apparently when one of his feet and fins got stuck in the rocks while trying to extract the victim and meanwhile he got pummeled by another set of waves. 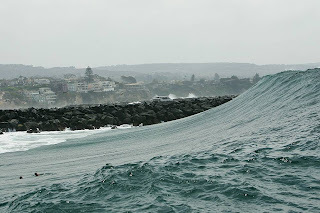 In addition, Surfline has posted the following video which shows just how powerful this Storm was in terms of the Waves that came ashore at the Wedge. Enjoy ! *** And here's something from Yahoo ! Woo Hoo ! (Photo/Copyright Lisa Jalvie 2009. All Rights Reserved. Do not reproduce without permission. Thumbnail used as representative of open link to photos below). *** Still Hungry for more Wedge photos ? Check out these photos at the link below by Rendell Swart. All Photos Copyright Rendell Swart 2009. All Rights Reserved. 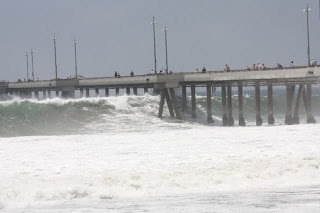 This storm and the surf it brought ashore to SoCal south facing beaches is going to be remembered for years to come. 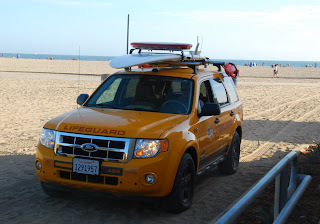 While Newport Beach guards were pulling people out at the Wedge and elsewhere, LACo beach guards, esp. 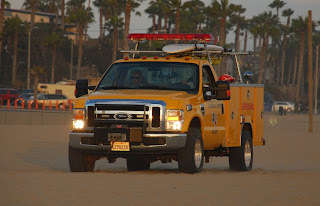 in Venice were pulling people out of harms way adjacent to the Venice Pier and in the Avenues where Venice Blvd. meets the sea. 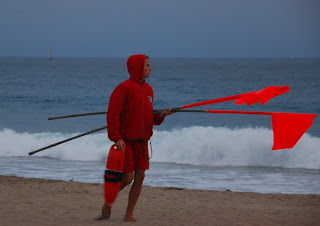 Just north of there at Rose Ave and Navy St., a third year guard, Chris Newman, and three of his fellow guards hit the water at Rose Ave. to rescue a man and a woman pulled out by a riptide only to be hurled headlong into the impact zone when a 10 foot set rolled in. 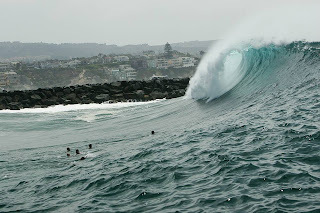 Only Chris managed to make it through the surfline only to find neither victim outside the impact zone. The male victim having been picked up by another guard inside in the impact zone. 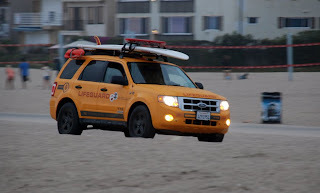 Meanwhile the female victim, after getting laundered in the impact zone, was pulled along helplessly in the strong inshore lateral current pulling toward Santa Monica, where she was fortunately picked up by a rookie guard who could not make it out through the 10 foot set of waves. Just another day.... Hardly ! Surely a day that each of the guards up and down the coast will remember for the rest of their lives. I couldn't resist as I was up flying on assignment today & flew over Venice & Santa Monica to see the surf. Here are a few pictures." *** Thanks Mark ! 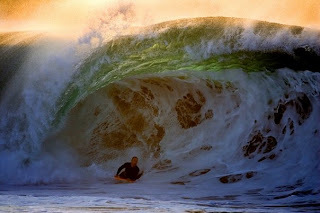 Absolutely Outstanding Rip Current Shots ! And this is where we catch back up to our original content posted on July 22, 2009. Woo Hoo ! 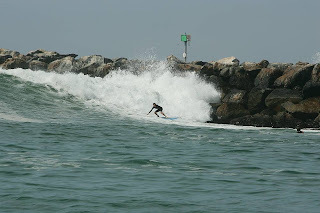 South facing beaches in SoCal are expecting some major league storm surf this weekend with waves expected to start increasing on Thursday, July 23rd ! Check it out and be careful out there ! "We're watching it and we're prepared . 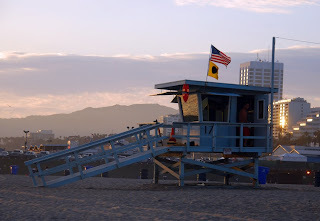 . . but then again it's a prediction, so things might change," said Mickey Gallagher, the Santa Monica-based Central Section chief for Los Angeles County lifeguards. "Only time will tell." 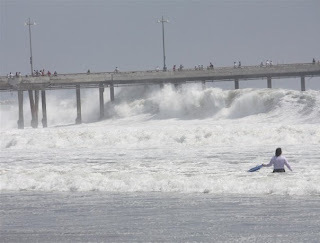 Postscript: This past weekend's massive surf introduced a new generation of lifeguards to the sheer force of mother nature. 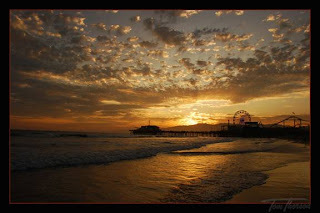 A sea change and tidal shift of generational proportions was witnessed on LACo beaches and probably elsewhere as well. 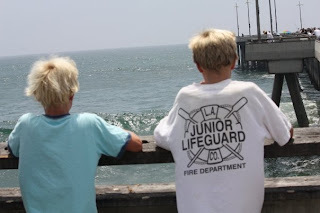 In Venice, Calif. alone, rescues were made by familiar names like Makuta, Newman and Contarsy..... and yet, folks, we are not talking about Jimmy, Mike and Steve, but rather the next generation, their progeny, namely, Kailey, Chris and Tyler ! 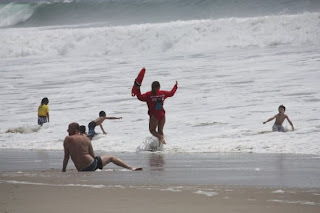 It is their time now to face down these challenges and they have done so, in no small measure due to the examples provided by their parent-lifeguards. The Torch has been passed and we are thrilled and we expect to hear of even more rescues and adventures in the future from these 'next gen' lifeguards and their contemporaries. 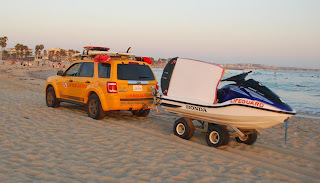 Save A Lifeguard, Row A Dory ! For all you Boaties, friends of boaties, etc. et al. 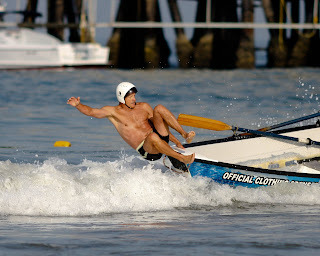 JG instructor and long time guard Eldon Onsgard shows his championship form at the Santa Monica Dory trials last week. Photo 604: Jamie Orr, Phillip Loy and Capt Tom Seth discuss dory strategies at Santa Monica 2009. Hope you can use the photos. Thanks Harry ! Spectacular ! And a couple more dory photos, just for the heck of it ! This next one I grabbed off of Facebook where Tony Whitmore had uploaded it so naturally it would look good here as well. Photo Courtesy of Tony Whitmore. Used here with permission. 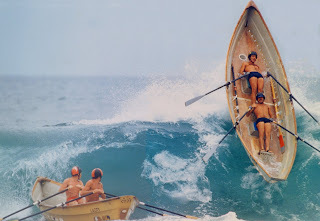 Photo below shows Dean Tom Katsouleas in the stern and Tony Whitmore in the bow, circa 1981 or '82. Dory Crew from yesteryear: The Quiz. 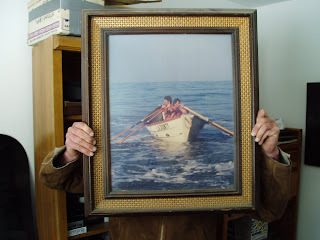 Can you name these two boaties from way back in the day, circa 1988 or earlier. Don't give it away Steigley ! The Dory as Pop Culture: A Boatie T-Shirt from Down Under, March 1986, Courtesy of the undersigned editor of "County Recurrent" News. And last but not least, the quintessential dory shot with Jake and Dale. Woo Hoo ! Just before this shot was taken, Dale told me he yelled to Jake: "ROW, Jake, ROW !!!" 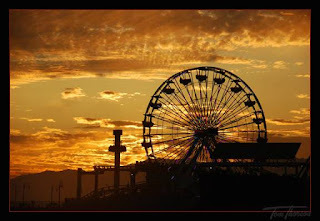 The following Stunning Photos are Courtesy of and Copyright Tom Thorson 2009. Used here with permission. Tom, a LACo Recurrent for many years, took these photos this afternoon and at sunset while Tom is visiting from the East Coast where he now resides. Thanks very much, Tom ! We really appreciate you sharing your photos with all of us ! "If This Is True, It's An Outrage !